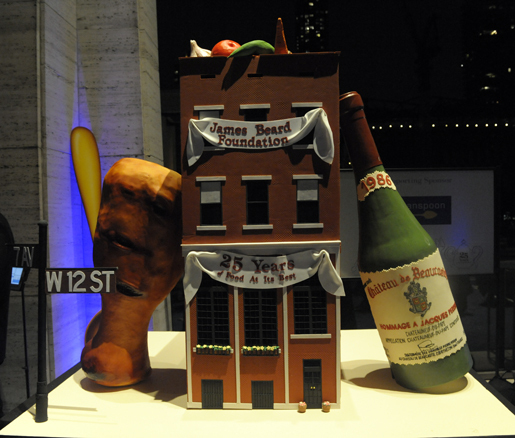 Next, Bruce Sherman of North Pond, and Mindy Segal of HotChocolate all won big last night at the 25th annual James Beard Foundation Restaurant and Chef Awards, which livestreamed from Avery Fisher Hall at Lincoln Center in New York City. "Covering all aspects of the industry—from chefs and restaurateurs to cookbook authors and food journalists to restaurant designers and architects and more—the Beard Awards are the highest honor for food and beverage professionals working in North America," says the Foundation. Next won Best New Restaurant ("A restaurant opened in 2011 that already displays excellence in food, beverage, and service and is likely to have a significant impact on the industry in years to come.") over AQ in San Francisco, Fiola in Washington, D.C., Isa, and Tertulia—the last two in New York City. Executive Chef Dave Beran accepted the award with chef/owner Grant Achatz and owner Nick Kokonas. Sixth time&apos;s the charm for new both Best Chef Great Lakes Sherman and Outstanding Pastry Chef Segal. Sherman prevailed this year over Michael Carlson of Schwa, Stephanie Izard of Girl & the Goat, Anne Kearney of Rue Dumaine in Dayton, OH, and Andrew Zimmerman of Sepia. Segal faced national competition from Joanne Chang of Flour Bakery + Café in Cambridge, MA; Melissa Chou of Aziza in San Francisco; Hedy Goldsmith of Michael’s Genuine Food & Drink in Miami; Dahlia Narvaez of Osteria Mozza in Los Angeles; and Ghaya Oliveira of Boulud Sud in New York City. Achatz was also one of five inducted this year into the Who’s Who of Food and Beverage in America, with journalist Mark Bittman, editor Dana Cowin, pastry chef Emily Luchetti, and publisher Marvin Shanken. WBEZ&apos;s own Fear of Frying: Culinary Nightmares hosted by Nina Barrett and produced by Jason Marck won the Radio Show/Audio Webcast category in the JBF Book, Broadcast, and Journalism Awards held the last Friday night at Gotham Hall also in New York City. Fellow finalists included, also from WBEZ, Worldview&apos;s "From Bread Lines to Revolution: The Role of Food in the Arab Uprisings" hosted by Jerome McDonnell and produced by Alexandra Salomon and Joe Linstroth; and The Sporkful hosted and produced by Dan Pashman and Mark Garrison. I spoke with Nina briefly yesterday about winning the Beard. "He’s in my purse," she said, "I already think of him as JB." "I always tell people, don’t read them on the website. Just click the listen to the story button. These food stories are meant to be listened to." The James Beard Foundation says, “Each award category has an individual Awards Committee made up of industry professionals who volunteer their time to oversee the policies, procedures, and selection of judges for their respective Awards program. All award winners receive a certificate and a medallion engraved with the James Beard Foundation Awards insignia." "..and to introduce our 3 minute musical homage to multiculturalism, special guest Jan Brewer!"